Eric J. Haskins, age 51 of Lac Courte Oreilles, WI, passed away Monday, April 8, 2019 at his home in New Post, WI. Eric John Haskins was born September 24, 1967 in Cudahy, WI, the son of Fred and Lois (Robinson) Haskins. 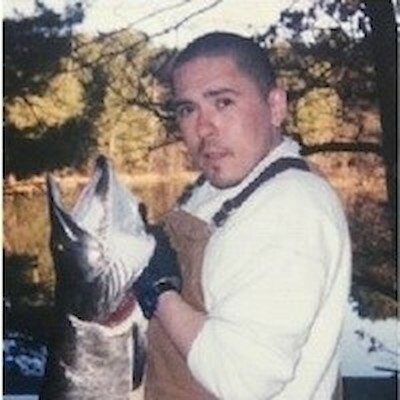 He was a proud tribal member and an avid outdoorsman with special fondness for fishing. Eric’s skillset demonstrated a strong aptitude for work both as a machinist and arborist – he loved to work outdoors in the fresh air and elements. He is survived by his mother, Lois Haskins; daughter Erica; granddaughter Hayden; brother Fred Haskins; sisters Lois Franklin, Laurie Haskins, Lisa Haskins & Michelle Haskins; many loving nephews & nieces and great nephews & nieces. Eric was preceded in death by his fpather Fred; brothers, Wade, Steven, Charles & Louis; uncle, Charles Robinson; and nephews Anthony Jerome “Snoopy” Franklin and Nicholas Creapeau-Haskins. Tribal Funeral Rites were held at 10:00 a.m., Thursday, April 11, 2019 at Big Drum Ceremonial Center in LCO. Lee “Obizaan” Staples officiated. Burial was in Historyland Cemetery in Hayward. Visitation began at 5:00 p.m., Wednesday, April 10th at Big Drum. Gigawaabamigoo miinawaa Gwayak-noodin! Honorary casket bearers were Fred Haskins, Dean Sullivan & Terrance Sullivan. Casket bearers were John Anderson, Brandon Coerper, Brett Coerper, Niiyaandiwed Haskins, Steven Mohawk & Dan “Boom” Sullivan.